I've already had it, don't get excited. But showing off my wedding gown on the Knittyboard got me to thinking about my wedding day. October 3, 1998. 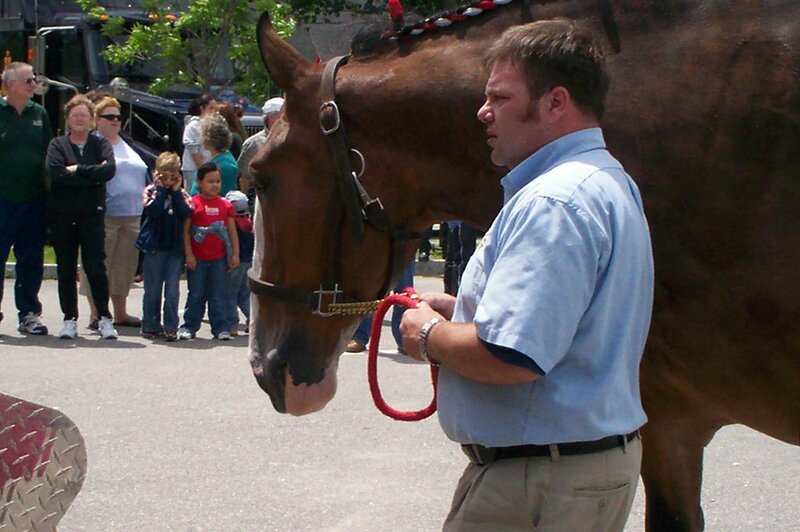 We originally wanted it for the 10th, but the Belknap Mill was booked for that day already, it being the date of the Annual Quilt Show, and since we decided that the hall was more important than the day, we moved it up a week. We got married at St. Joseph's Church in Laconia. My parents were married there, it's a gorgeous church, and Father Gary has a much more liberal stance on couples living together before marriage than does St. Joseph's in Belmont. So that's where we went. The day was absolutely perfect, weather-wise. Cool and sunny and bright, perfect for an afternoon wedding. My cousin Carla did my hair in the morning, and we had a light lunch at my mother's house while we dressed. 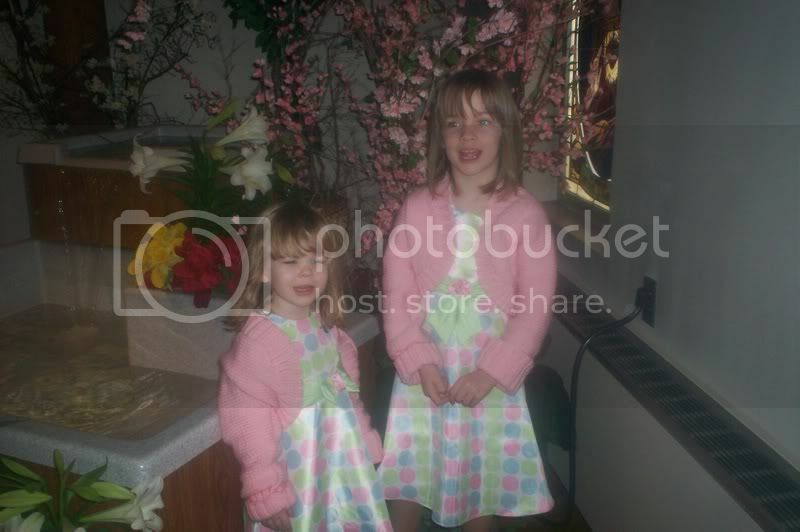 My sister was my maid of honor, and my husband's niece (mine too, now) was our flowergirl. Larry's best man was his brother Mike who introduced us in the first place. The wedding was a traditional Catholic ceremony, but with no singing. I was afraid of getting stuck with a reedy soprano warbling out Ave Maria, so the organist and I picked out some classic hymns and she played them on St. Joe's kickass pipe organ. She raised the roof off the place with the Ode to Joy at the end. Pulled out all the stops, literally. 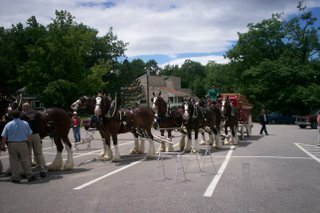 The reception was at the Belknap Mill in Laconia, just down the block from the church. It was on the third floor, and we decorated it in a fall theme with hay bales and pumpkins and cornstalks. The bar was an open one and suffice it to say that a good time was had by all. Oh, and my dress was made by a seamstress friend of mine who also made the cake--which was delicious, by the way. Traditional white three layer cake with a flower top that matched my bouquet of fall florals. I did all the embroidery on the gown, which consists of a jacket and full skirt. Click here for a shot of the back detail. Click here for a close-up of the front detail. So, I already told you that Friend Bob is an uncle again. You rem ember Friend Bob. Turns out he is not uncle to a bazillion nieces and nephews as I reported in my last post, merely an even dozen. Though in all fairness, by my count four of them are great-nieces and nephews, though I am certain that if my count is off, I'll be corrected soon. So baby Olivia Rose is the latest addition to the family. Which makes me happy because I prefer to knit girly things. 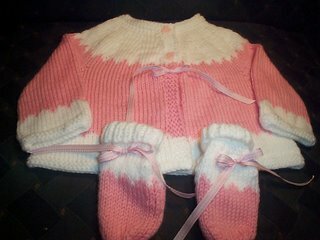 Not to take away from those of you who like to knit baby boy things, but give me soft and pink any day. The yarn is by Peter Pan by Wendy and its an acrylic/nylon blend. I know, I know, for a fiber snob it's an odd choice. I really do prefer natural fibers for many, many reasons, but this was wonderfully soft and the right weight for the project, as well as I already had it on hand and it's machine washable and dryable. It was, however, quite squeaky to work with and it stuck like the very devil to my bamboo needles. 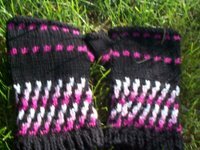 I worked the body on my Addi Turbos, but had to use my bamboo dpn's for the sleeves and--well, just ugh. Plus it was wicked humid today so finishing the sleeves was pure torture. But it's done. The buttons are little pink bunnies...so cute! For the booties I just used a basic sock pattern in an infant size and added a row of eyelets at the base of the ribbed, turned down cuff. And the gingham ribbon will help hold them on the little feet, hopefully. Tomorrow I will stamp a card, wrap the box, and send it off to the new baby. 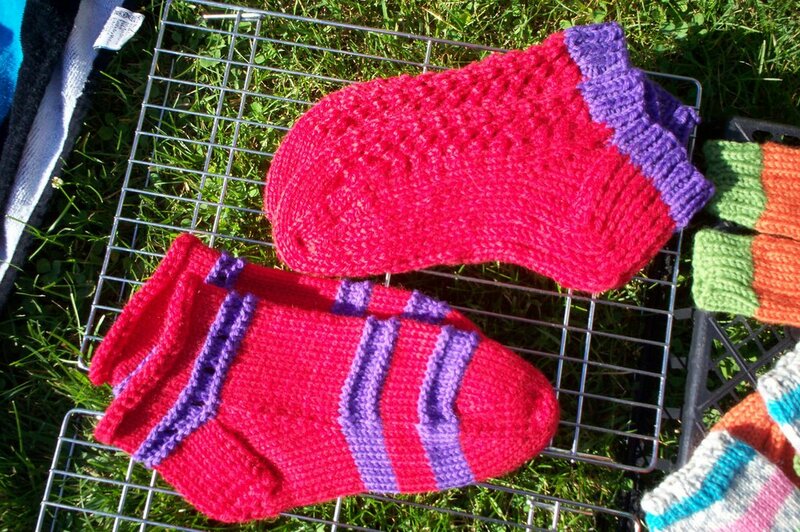 And then I think I will start another pair of Red Hatter slippers. So, I finished up a bunch of stuff, and got it all washed and blocked today. It's the first day it has been both sunny and dry enough for such things. And I've been busy! Well, we did have those weeks of unending rain, followed by unrelenting heat and humidity. So it's not my fault. Two chemo caps. Sadly, two friends have been recently diagnosed with cancer and these will come in handy, I'm thinking. The top one is of Debbie Bliss Baby Cashmerino with a tassle rib border from Nicky Epstein's embellishments book. The second is made from Rowan Calmer and is from the Head Huggers website. 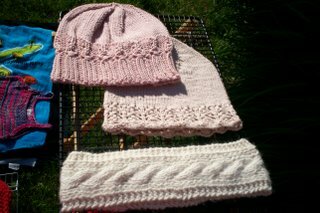 The third item in the picture is a cabled headband that used up a bunch of the Plymouth Yarns Suri Alpaca I had leftover from the teacher mittens. 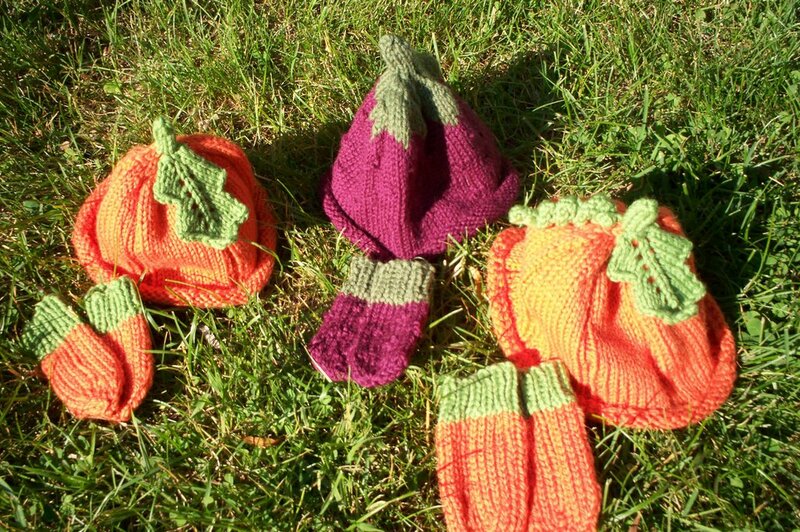 In the next photo we have a couple of pair of "Red Hat Lady" slippers. The lady in my choir loved the pair I made her so much that she commissioned me to make some for all the gals in her Red Hat Lady group. Fifteen pair, to be exact. Two down, 13 to go. 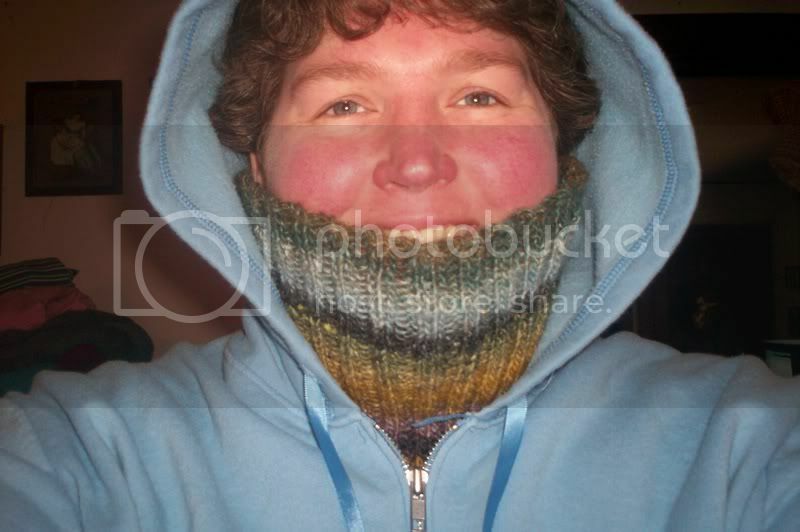 Don't worry, they knit up quick...and I'm getting paid. 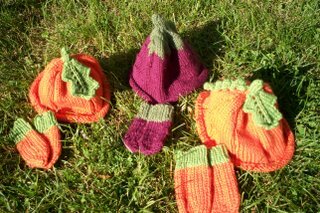 The next picture is a couple of pumpkin hats and mitts and a raspberry hat with matching mitts. 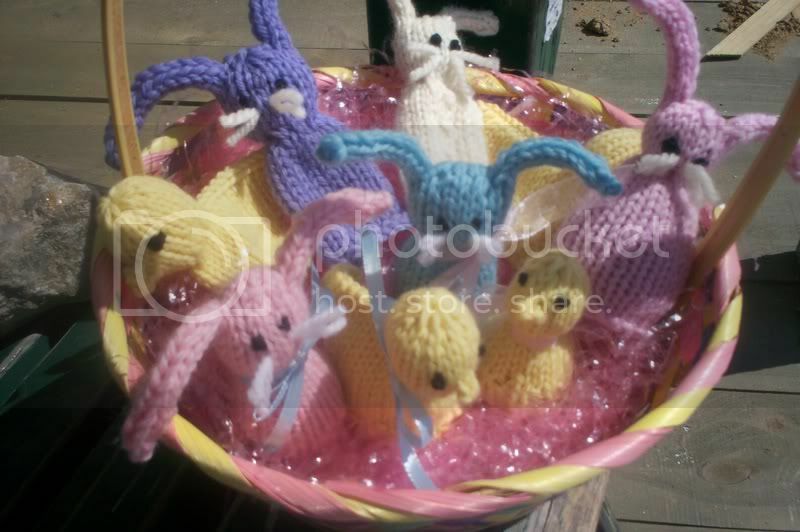 They're all from the Anne Norling pattern...give or take. I did change a few things here and there, and I made the mitts up on my own. No thumbs since they're in baby sizes. Newborn and 6 months to a year. I'm going to make some apples too. 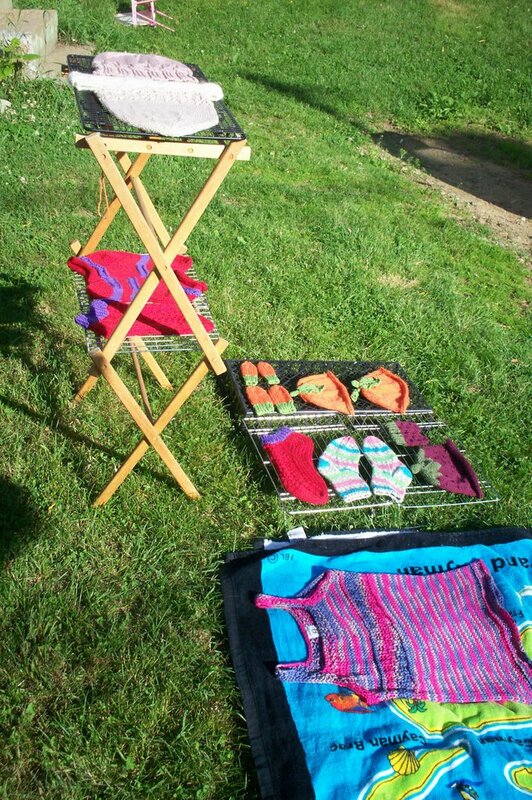 The last pic is just a pair of toddler-sized socks made from a Knitpicks self-striping yarn. I forget what it's called though. So unlike me. Tonight we had some steak tips on the grill and we all went out for ice cream at Sawyers Dairy Bar. If you ever find yourself in the Lakes Region of NH, you must have a cone at Sawyers. I had their new flavor, chocolate oreo, and it was to die for. Their chocolate is the best chocolate ice cream ever, in my opinion. School is out and a long summer with both kids and no car is ahead of me. I really have to find the sprinkler. I know it's in the barn somewhere. 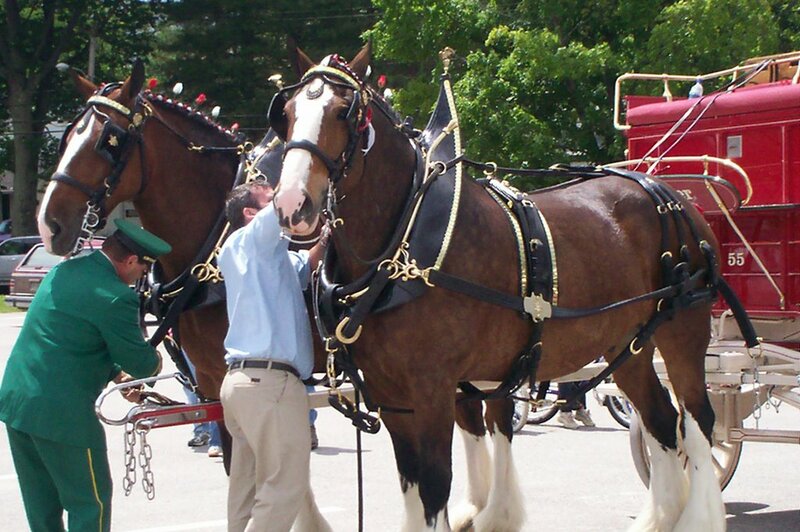 I'm also excited that I got into the Canterbury Fair as a vendor. I think I meant to do it last year but perhaps had another fair that day. I forget, exactly. But it should be a fun day, God knows I'll see tons of people I know--Canterbury is like that--and hopefully make gobs of money hand over fist. Yeah, I dream big. Saturday is going to be a busy day. My cousin Ben's new restaurant is opening and we are going to be his taste testers. And later in the day, we're having a birthday party for my dad, who turns 65 tomorrow. His last day of work is Friday, and I couldn't be more excited. And I have my next project picked out...Friend Bob (you remember Friend Bob) is an uncle again, for the bazillionth time, and his new niece Olivia Rose needs something precious and handmade. Like this. And I have an excuse to hit the yarn shop again. Well, I have to get just the right yarn! It's a gift! So on the way, I asked them some questions in the car, just to see what they'd say. Rach and Mary *overlapping* "Well, yeah. Of course it does. If it makes a sound once, it makes a sound all the time. Especially if it hits a rock." Rach: "Ten. Or maybe eleven. I'm guessing." Mary: "Depends how big the angels are. Eleven if they're small." So we got some topsoil and some plants and we planted just ahead of the thunderstorm. The garden needs some bark mulch to keep the weeds down, but that will have to be another day. 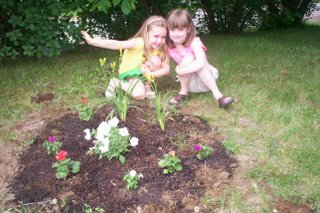 The girls planted impatiens, geraniums, daylilies, and petunias. And some sunflower seeds, but you can't see those. Yet. No, they didn't plant the irises! Then we had cheese pizza and our playdate was over. Tomorrow it's at Rachael's house! Hurray for best friends! So, it's my first foray into teacher gifts since I was in grade school. I think they came out quite nicely! 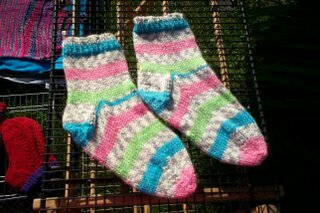 The first pair is for Ms. Malavet, the special needs aide. She's there primarily for one kid, but helps out with all of them, of course. She said her favorite color was yellow, so these are Mountain Mohair by Green Mountain Spinnery in rhubarb, with wool embroidered flowers in yellow. Ms. Hastings is the teacher and loves magenta. I do not, so this is the second pair I made, deciding after all that I hated the first all-magenta pair I came up with. These are done with a combination of wools: Galway, Wool of the Andes, and Nature Spun, using Zib's mosaic pattern from the Il Cestino bag. 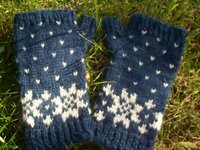 Mrs. Peterson is the other aide, and she likes navy blue, so hers are a traditional Norwegian 8-point star and lice stitch patterns. 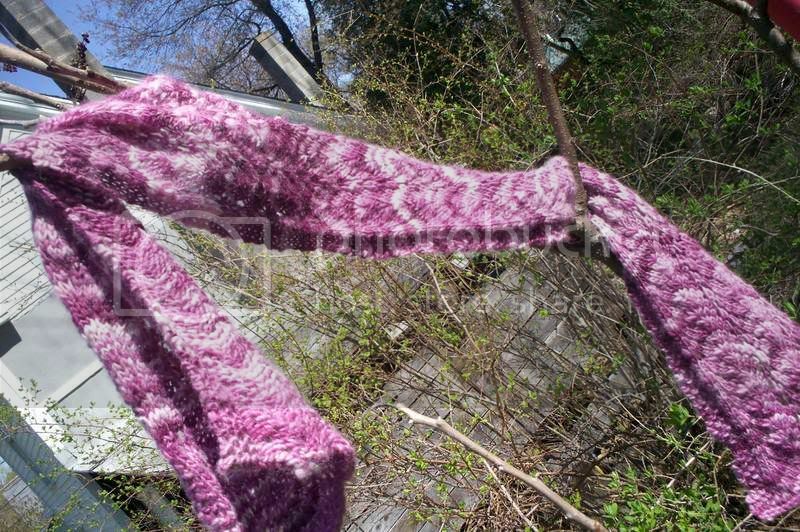 The yarn is Plymouth's Suri Merino, a blend of (you guessed it) Suri Alpaca and Merino wool. They are so soft they almost feel like angora, but with a heavy drape like silk. I'd use this yarn again in a cocaine heartbeat. 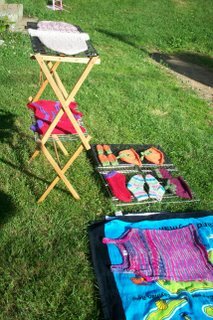 Now they've been washed and dried in the warm sunshine and are ready for their tags and wrappings! 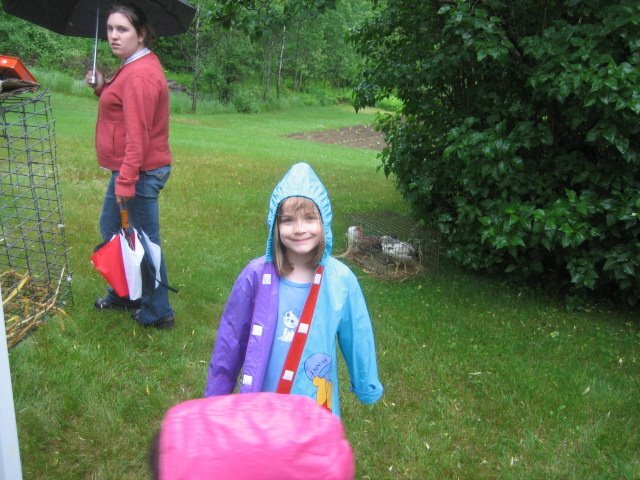 Only four days left 'til summer vacation! Aren't they something? You should see them close up. I mean it, if you haven't seen them in person, try to. What magnificent animals. And here's some more of the pictures. Still raining, after all these years. Well, not years, really. But it seems like it. I was going to have this long, lovely post on Friday recounting my birth experience with Miss Buggy, but the rain has just got me down. Down, down, down. If I don't get some sun soon, I'm going to go buggy myself. But I do have a few cute pics from her birthday last weekend to share. Note that it is quite wet and very rainy. Nothing has changed. It is still wet and rainy. Just so you know. 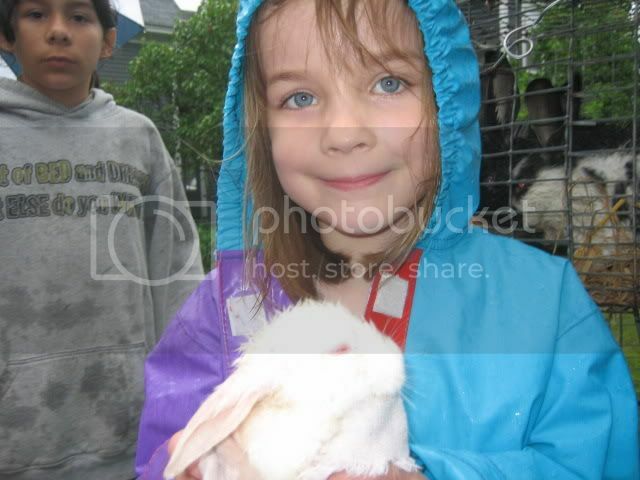 This first one is the birthday girl holding a wee bunny. They were for sale, and at a bargain price of a mere ten bucks. I was quite sure my dad was going to buy her one, since he's been threatening it for at least three years now. He even has the bunny hutch built and set up beside the barn. It could happen any day now. Hey, as long as he feeds and cleans them, he can have a hundred of them. Stranger things have been know to happen with rabbits. I am pushing for an angora. At least get a useful rabbit! 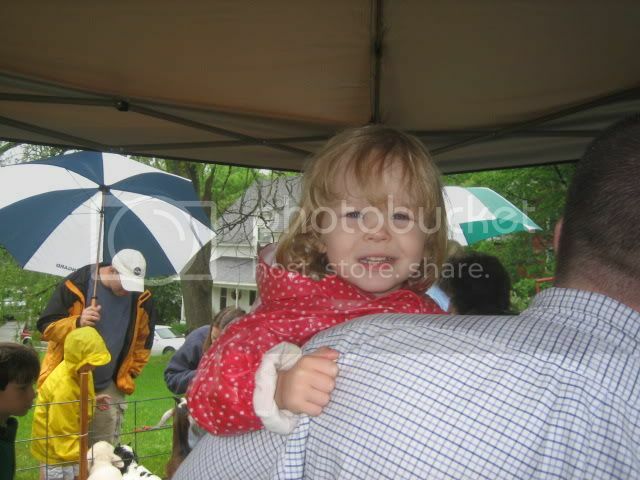 This is Miss Emmaline Beaudalaire, and I think her smile combined with her position firmly attached to Papa's shoulder says it all about her opinion of goats in general. The smile that says, "I'll smile if you take me out of this pen and away from these smelly, noisy beasts." Ironic, coming from such a smelly, noisy beast such as herself. Nah, I really do love her. A great deal of the time. So she's two...sue me. 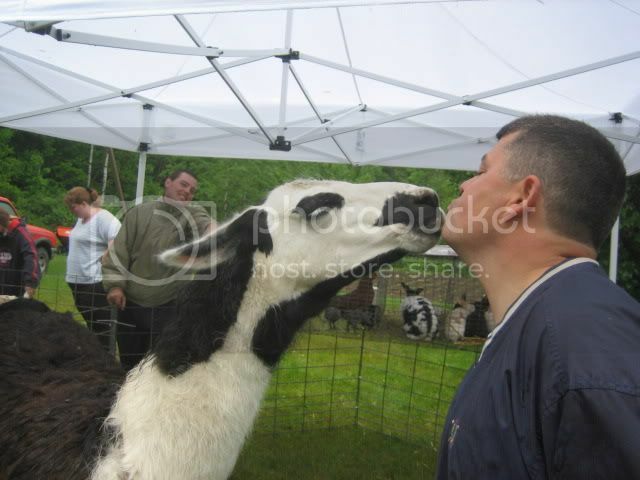 And finally, Baboo and the llama. I mean, who doesn't love a llama, am I right? Baboo put up the cash for the petting zoo, and his wife, my sister, the girls' Tanta, called me that morning and suggested that we move the whole party next door to her house since mine is waaaaay too small to hold all the folks. That tent over our heads was supposed to be shielding us from the hot, baking June sunshine. So much for that plan, eh? When I was two, I was hardly new. When I was three, I was barely me. So I think I'll stay six now forever and ever. I'm paraphrasing here, my apologies to AA Milne. Not that he cares, being dead and all. 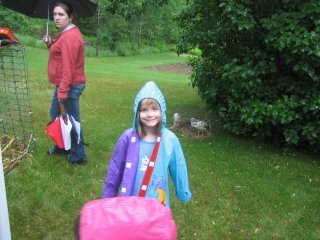 And we have one more week left of kindergarten. On Friday she has step-up day, when she will find out who her first grade teacher is going to be. They'll go to their assigned classes for next year, see their rooms and their teachers, and then after that, go outside for fun and games, and do lots of fun stuff as teams with their new classmates. 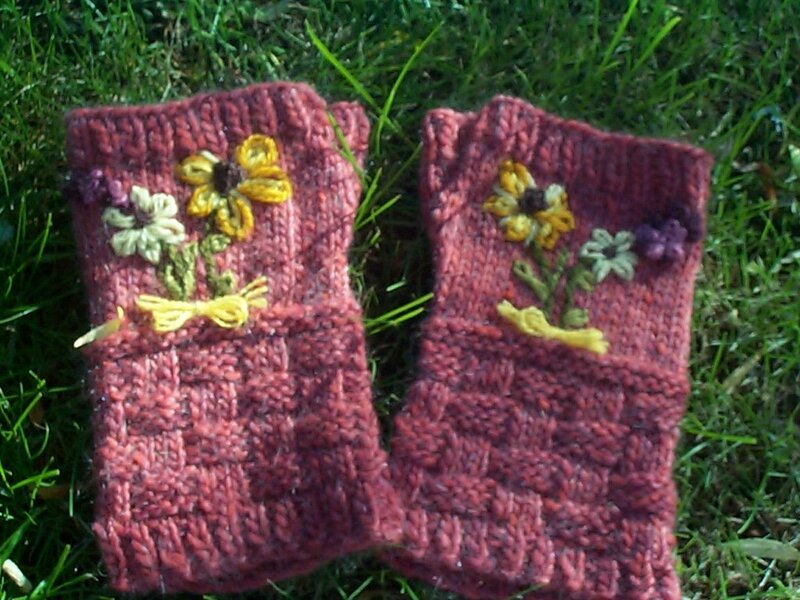 Today I finished the fingerless mittens for her three teachers. I will blog the photos after they are washed and blocked. Supposedly the sun is supposed to shine a bit tomorrow, and then a lot on Monday and Tuesday. She is six years old today. It doesn't seem possible. Tickled pink to find himself on a blog, Friend Bob dropped an email to let me know how much he first enjoyed seeing himself blogged about, and second how much he enjoyed my last post that was less knitting and more Poops, because as he put it, "We could all use a bit more of the Poops." So before I get to the knitting portion of our blogging program, I have a question for you: guess who was asked to be a cantor at church? 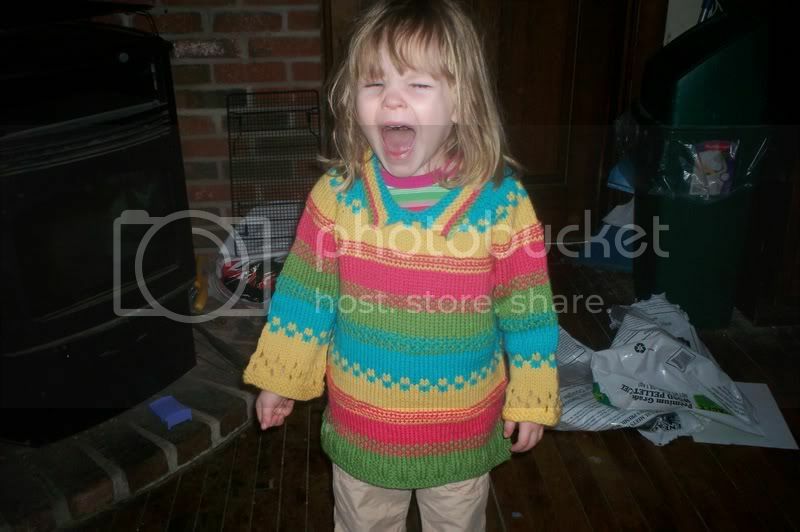 And she said my voice was "lovely." Did you hear that? Someone told me I have a lovely voice! I'm so pleased I could pop. I just might, later. Or have a few pops. Perhaps some pina coladas to celebrate. But I digress. And now for the knitting. Two FO's! 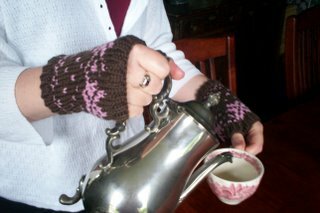 Fingerless mittens. 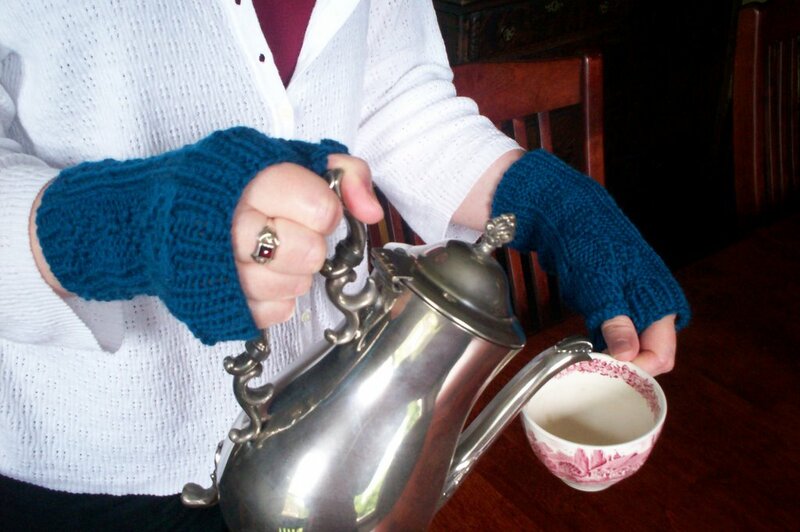 I've never seen the point, myself, since my hands are usually warm and my fingers cold. But I do see that there are times and places where open fingers would be useful, so I've made some. 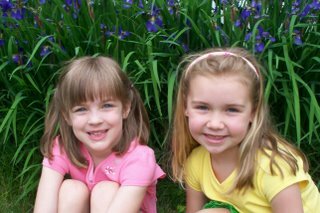 Here are the pictures, modeled gracefully by Sister. If you love them so much you just have to have them, they are also going to be available momentarily in my Etsy store. 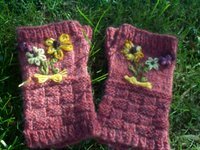 The first pair are the Norsk mitts, done with Knitpicks Wool of the Andes in chocolate and Merino Style in petal. They feature the 8-point Norwegian star and the "lice pattern". 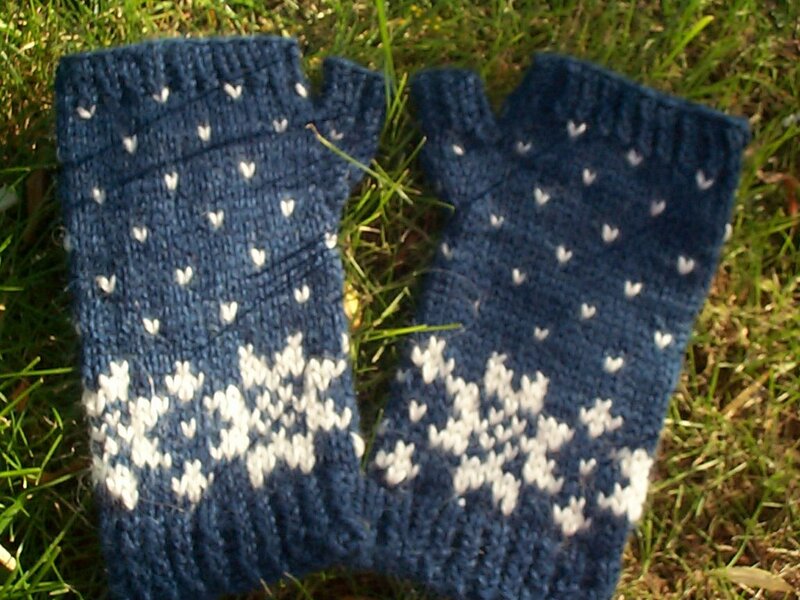 The second pair is the Double Diamond Mitts and they're done with Knitpics WOTA in Stream. The pattern is a moss diamond rib. I was thinking of making these for the Bug's kindergarten teacher and her two aides for an end of the year gift. I was originally thinking something kind of grownup-y and elegant, but then I thought they'd probably get more use out of some that are a little more whimsical. Perhaps I'll do some colorwork and put some letters or something on them in bright colors. I better hurry, though because school ends in two weeks. Only 10 more trips to the bus stop. Yay!